COMEY INVITED TO TESTIFY: “Ousted FBI Director James Comey has been invited to testify in a closed session next Tuesday before the Senate Intelligence Committee,” Politico reports. WHY TRUMP COMMITTED THE CRIME OF OBSTRUCTION OF JUSTICE: President Donald Trump “weighed firing his FBI director for more than a week. When he finally pulled the trigger Tuesday afternoon, he didn’t call James Comey. He sent his longtime private security guard to deliver the termination letter in a manila folder to FBI headquarters,” Politico reports. The Washington Post notes that White House press secretary Sean Spicer would only answer questions about the firing of FBI Director James Comey in the dark: “After Spicer spent several minutes hidden in the bushes behind these sets, Janet Montesi, an executive assistant in the press office, emerged and told reporters that Spicer would answer some questions, as long as he was not filmed doing so. Spicer then emerged. Meanwhile, Deadline Hollywood reports that Melissa McCarthy is hosting Saturday Night Live this weekend. It’s really difficult to keep up with everything. That said, Trump probably should be losing it. Declaring war on the intelligence community was a Yuge mistake. I know, Pandora. I marvel that a 70ish overweight man and his motley but increasingly shrinking team of advisors and toadies have so much energy to do bad! Oooh. McCabe just threw big shade on the WH story line that the rank and file at the FBI had lost confidence in Comey. 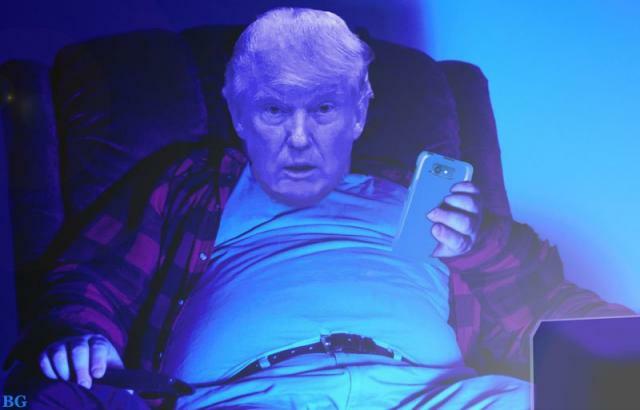 Is Drumpf sxreaming at the TV now? Will he be next? Going to place a wreath on Nixon’s grave: For He Is Risen…. and this time he’s orange.